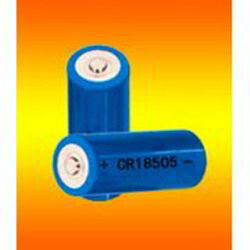 In line with clients' diverse requirements, we are presenting a qualitative range of Forte CR 18505 Battery. Our offered Forte batteries are checked by quality controllers for dispatching a defect free range. These Forte batteries are designed utilizing high grade material and advance technology. The given Forte batteries can be availed in various specifications within an available time-frame in bulk quantity. Looking for FORTE LIMNO2 LITHIUM BATTERIES ?